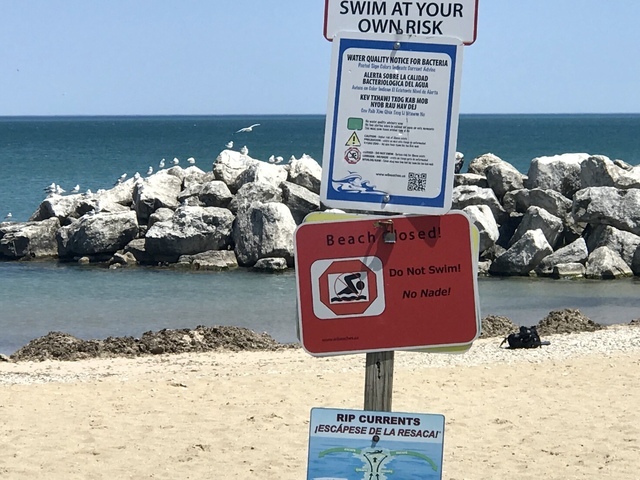 MILWAUKEE -- Multiple beaches along the Milwaukee lakefront were closed on Monday due to bacteria, yet people were still getting in the water. McKinley and South Shore beaches were shut down for high levels of E.coli. No matter how cold the Lake Michigan water may be, Hannah Milakovich and Danielle Chapuis' first beach trip of the year involved getting a little wet. "We put our toes in a little bit, but besides that, we have not gone swimming," said Milakovich. They walked up to the shoreline without noticing the two signs that say the beach is closed for bacteria. "It's freaky that it's closed and we didn't even know," said Chapuis. They weren't the only ones. The Martins made a family trip to the lakefront for a swim. "I didn't even notice the sign. I just saw it was unattended and it was OK," said Joseph Martins. The Milwaukee Health Department has been testing for bacteria, especially E.coli in the water for the past decade. "E.coli can be a result of human and animal waste and a variety of factors in the water itself," said infectious diseases expert Lindsey Page. Page said samples show it's gotten much worse over the past few years. "Symptoms could include gastrointestinal symptoms such as nausea, vomiting and diarrhea," she said. TODAY'S TMJ4 asked why the signs aren't more visible to the full length of the beach. "We work with (Milwaukee) County Parks to identify the right places for the signs and where the highest traffic is and we're trying to get the signs in places where people actually see them," Page responded. For Monday, the Martins plan to wash off well right when they get home. "Well I'm glad I didn't ingest any water, let's just say that," Martins said. He calls it a lesson learned for when they return. "I'm definitely going to watch harder," he said. Click here for a look at daily bacteria statistics along the Milwaukee lakefront. The page is updated each day until Labor Day.